They’re here to catch our every fall, wipe away our tears, keep us safe at night and teach how to throw a baseball yet not very often do we get the the chance to show off our appreciation to the fathers in our lives… So let’s all take a moment to give a big round of applause to our dads in celebration of the one and only Father’s Day! While Mother’s Day is often saved by the ever handy box of chocolates and bouquet of flowers, getting Father’s Day gifts in a pinch can often be a bit tricky. Don’t overthink it! Just send your old pa a Visual QR Code themed Father’s Day card which will link to an extremely funny video (like this example) when scanned. Simple, slap-stick humor combined with the intrigue of codes. 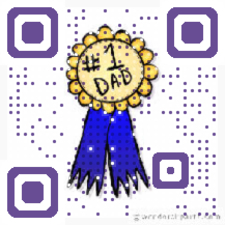 Dress it up as an Animation QR Code to score points. Step up the heat with a cleverly designed Business QR Code Card. Don’t worry about getting the little details right down to the last dot, your father can always edit the info and we promise he’ll love the innovative idea! Create a memorable recommendation book of your favorite hikes, bike rides and eateries. Design it with your favorite pics and a couple of heart-felt words and use Visual QR Codes to link up to your trail directions or a Google Maps location. So with little time to spare, there really is no excuse to sit dad out on this one. And if you want more ideas, you’re welcome to scan our QR Code to check out this great list from uncommongoods.com!